during our 3pax family holiday in croatia in apr2018, we took croatian brodet (which is like a simpler bouillabaise) a few times, especially at kopun in dubrovnik. AND the croatian brodet was the best dish of the evening, everyone’s favourite! the fishes in croatia were very fresh (though not living swimming in tanks). the seabass there did not look anything like a seabass or barramundi..it was slimmer & head was sharper but it was the best fish there, better than sea bream…in singapore i would count sea bream (ang kor li) as a better fish than local seabass…the seabream didn’t look much like our seabream here either. 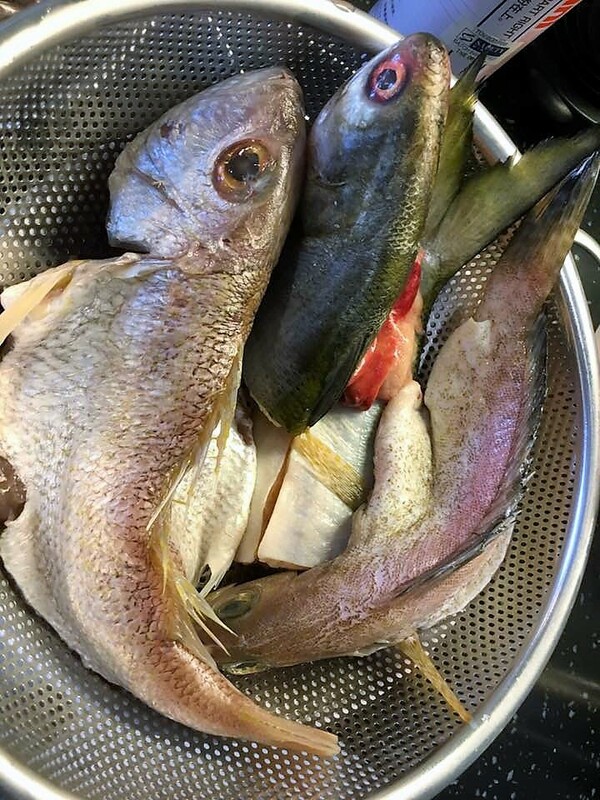 for 6pax, i used only 1 small seabream, 1 small garoupa, 1 small treadfin (ngoh soon) cut in 2, plus a sailfish fillet i bought at phoon huat delicatessen for the 2 dishes – brodet & grilled fish. specifically for the brodet, i used the treadfin head 1/2, whole seabream. i fried red onions, chopped scallions, sliced ginger, whole coriander till fragrant then added chopped garlic. i used intense chicken stock, so broth was very tasty. the fish i cooked for about 4-5mins. when serving i heat up covered, added the prawns & the littleneck clams (la la) to cook, then served. so as it turned out it was very easy to prepare the brodet, just a very good chicken stock…i prefer chicken to shellfish/prawn stock as it is more neutral & malleable, has wider preference as some may not like prawn stock. 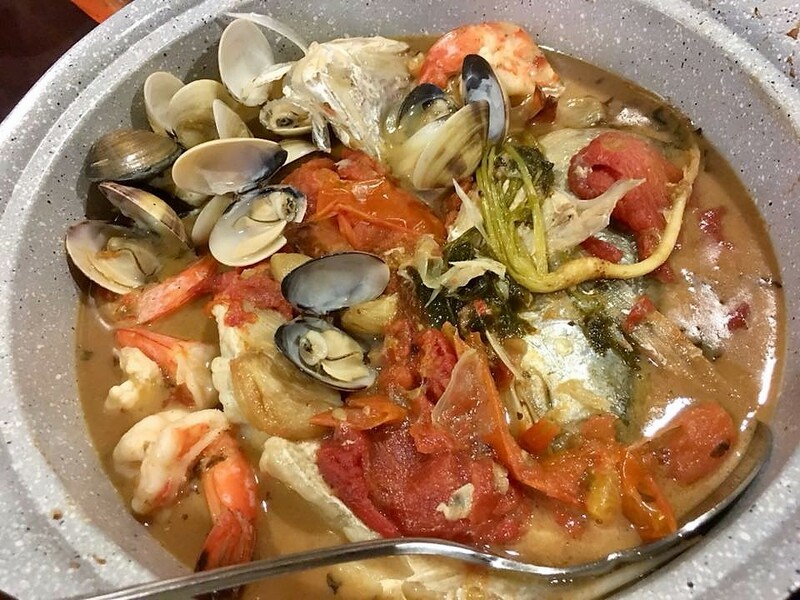 so once there is a very tasty and savoury stock base, it was easy adding the fish and then adding the prawns and littelneck clams or whatever other seafood one desire. P.S. my friend and his wife then visited croatian and went to kopu, the restaurant we recommended and took the brodet. and he messaged me then that my brodet was better. of course it was just individual taste & preference. my daughter will swear by kopun, and i also think the brodet was excellent there. fry sliced red onions, chopped scallions, sliced ginger, whole coriander till fragrant then added chopped garlic. add intense chicken stock, so broth was very tasty. add fish cook for about 4-5mins. add tomatoes. when serving heat to boil, cover and add prawns & littleneck clams (la la) to cook, then serve. This entry was posted in Buon Appetito!, Recipes, western & japanese. Bookmark the permalink.